Are you in need of excellent restorative dental care in New Jersey? If you’re missing one or more teeth, we know the answer is an emphatic “yes.” Dr. Robert Young is the dental implant expert Manahawkin, NJ trusts with rebuilding its beautiful smiles! Keep reading to learn more about dental implants as well as Dr. Young’s expertise in this field — then contact Young Dentistry to learn about your options with dental implants and dentures. We can’t wait to help you get your best smile back! Absolutely nothing replaces missing teeth better than dental implants. That’s because nothing else replaces the missing tooth as well as its root — the crucial factor in keeping the jawbone healthy and whole. 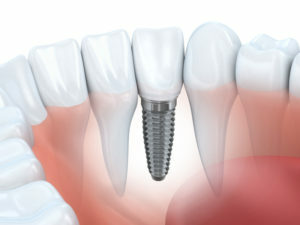 Dental implants are tiny titanium posts that are inserted directly into the space left by each missing tooth. After a period of six months on average, the jawbone gradually fuses with the implant for the ultimate in stability. Dental implants restore your ability to eat, speak and smile without the worry of flashing gaps or an ill-fitting device. No need to bother with messy denture adhesives. Dental implants encourage good oral and overall health for years to come. When cared for properly, dental implants can be expected to last the wearer’s lifetime. Young Dentistry is proud to offer patients with missing teeth Dr. Young’s expert care. He’s a leader in dealing with tooth replacement using dental implants, and he specializes in complex cases. In fact, he’s been named a top dentist by Consumer Reports for the past ten years — a special distinction shared by few dentists. At Young Dentistry, Dr. Young offers surgical placement of dental implants as well as the prosthetic restoration (the crown, denture or custom abutment that goes on top). In addition to being the trusted name in dental implants for Manahawkin, Dr. Young is also highly trained in sedation dentistry to give patients the ultimate in comfort, no matter what their procedure may be. He can provide oral and IV sedation for patients with dental anxiety, or those who wish to undergo long procedures in just one visit. If you’re interested in restoring your smile with dental implants, you can’t go wrong trusting the very best in Manahawkin, Dr. Young and the team at Young Dentistry. Don’t wait another day to get started rebuilding and rejuvenating your smile — get in touch with Young Dentistry to learn about dental implants or dentures in Manahawkin NJ! Request your appointment online today.